Save the date & join in the fun as we celebrate the last of the warm weather and longer days, and savour the beautiful colours of the New England. 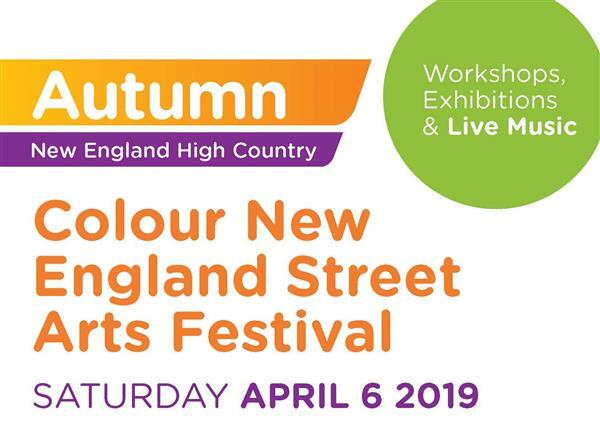 Join local artists, musicians, writers, performers and crafters for an exciting day of fun and creativity at the inaugural Colour New England Street Arts Festival. The festival will bring Armidale's Beardy Street Mall and surrounds to life from 2pm and culminate with a light show at 8pm. A makers' markets, arts activities, exhibitions, crafts, workshops and street art will be accompanied by window displays, demonstrations, street theatre, food markets and much more. Musicians will perform in the mall and nearby venues from 2pm to 10pm. For more information and the Official Program visit the Armidale Regional Council webpage.